Shortly after the attack, police arrested a 15-year-old from Arab Takua as a suspect in the attack. More arrests to follow. 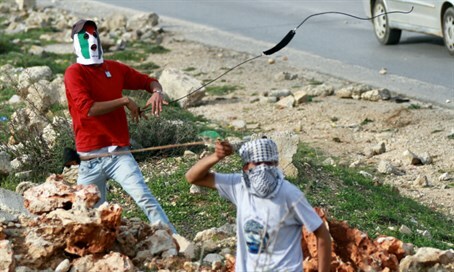 A group of Arab rock-throwers attacked Israeli vehicles on Thursday near the Tekoa community of Gush Etzion. A mother and her six-month-old son were lightly injured by the rocks. They were treated on site and did not require hospitalization. Two additional Israelis also suffered shock. Shortly after the attack, Hevron Police arrested a 15-year-old from the Arab village Takua as a suspect in the attack. More arrests are expected to follow. Moshe Marom, the father of the family, who had been driving the attacked vehicle, was not hurt, but described his fear during the attack. "The [Arab] children had just gotten out of school and when I passed near them, they threw rocks and cement blocks. They just blew up our car," he recounted. "I had three children in the back - a six-year-old boy, a three-year-old toddler and a baby half a year old. Miraculously nothing happened." "I was afraid for my life," he added, "but I managed to keep control with both hands on the wheel and drove on." Arab rock attacks against Jews have become increasingly common in Jerusalem and Judea-Samaria, particularly since the start of the High Holiday season in mid-September. On Rosh Hashana eve, Jerusalem resident Alexander Levlovich, 64, was killed after losing his control of his car when Arab terrorists pelted the vehicle with a barrage of rocks. The Israeli government has vowed to crack down on rock-throwers, including introducing legislation setting a minimum four-year jail time for such terrorists as well as other deterrents. In response to this latest attack, Gush Etzion Regional Council head David Perl urged the government to "take a firm and uncompromising hand against rock-throwers, until safety and calm is returned to inhabitants of the region." "While Abbas is spreading lies and encouraging violence and terror on the UN stage his words are translated to the field with rock terrorism that grows and grows," Perl charged. "Only a miracle saved the lives of family members attacked near Tekoa today."